All Aboard the Bookshelf: Step Inside Our New Site and Save! Step Inside Our New Site and Save! 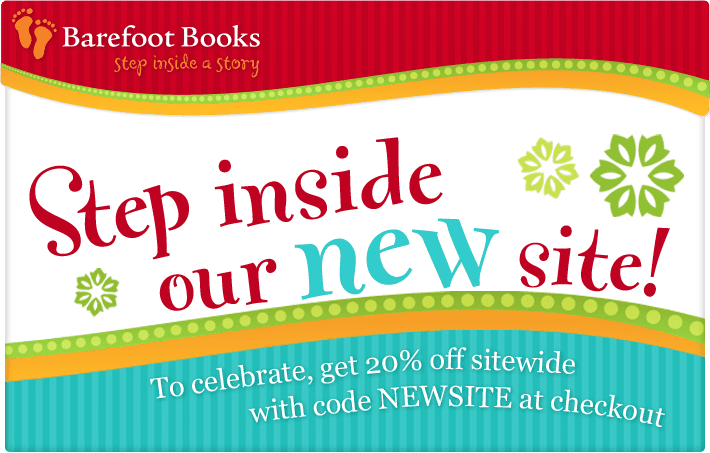 Barefoot Books has redesigned our website and it is fabulous! A fresh new look, easier to navigate and find what you're looking for, and lots of fantastic new resources! Looking for arts and crafts activities based on our books? We've got that! Are you a teacher who needs a lesson plan based on one of our books? We've got that too! Want to start a book club for kids featuring our books? We've got discussion guides! Want to find out more about future books and even give your input directly to the Barefoot editors? Then step inside the Creative Cauldron, one of our new public forums! There's so much more to explore, too - take a peak and let me know what you think! AND to celebrate, we are offering customers 20% off all orders between now and March 10th with the discount code NEWSITE! Great News - NEWSITE Discount!